"None of you [truly] believes until he loves for his brother that which he loves for himself." This is one of my favourite hadiths; one that I try to practice in my everyday life (keyword: try) because I believe that being sincere with others is a deed much beloved in the sight of God, and being sincere with others includes wanting the best for them in this life and in the hereafter. Sometimes this means giving advice to the people we care about. I know giving advice can be a little tricky. When I was going through notes from a class taught by Imam Suhaib Webb I stumbled upon a few lines I had written down about the art of giving advice or naseeha. Did you know that naseeha is often translated as 'advice' but a better translation for the word is 'sincerity'. That fits in very nicely with the idea of advice being an act of sincerity. And that's when it hit me. The best way to give advice is to think of it as a gift. Who doesn't love receiving gifts? 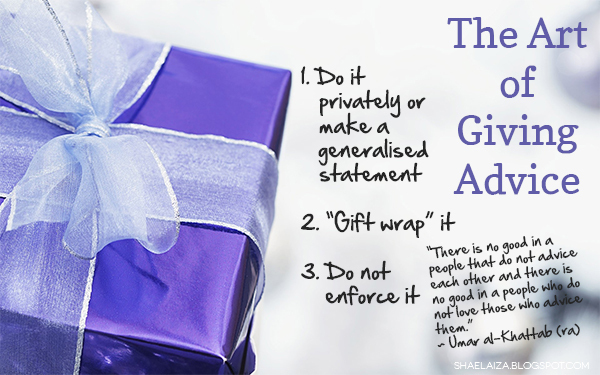 So visualise this: When you offer someone a gift how do you do it? Do you throw it at them? Do you give it arrogantly? Of course, not. That's now how you'd want to be treated, right? Part of gift-giving is the way the gift is given and part of giving advice is the way it is offered. The most crucial part of giving is to give with sincerity and love for Allah (swt) and your friends and loved ones, and being sincere in our actions means we are motivated to do it in the best of ways. 1. Give advice privately to avoid embarrassing the other person. If you don't know the person personally you can make a general statement so no one knows who it is directed at. That way many people can benefit from the advice instead of just one person. 2. "Gift wrap" it. When we buy a present and a piece of wrapping paper to wrap the present with, we take several things into consideration such as: Who is the gift for (e.g. male or female, age, personality)? What is the occasion (e.g. birthday, wedding, farewell)? What do they like (e.g. interests, hobbies)? The following story by Amr Khaled is probably the best example of "gift wrapping" a piece of advice done in such a way that it brought out the best in the person instead of making them feel humiliated or bitter. After all, it was done by our beloved Prophet Muhammad (peace and blessings be upon him). 3. Do not enforce it. Sometimes our desire to see our friends and loved ones do better can make us feel upset when they choose not to take our advice, but sometimes it is our bruised ego that is upset when our advice is ignored or not acted upon immediately. If our prophets (peace be upon them) faced challenges when advising their communities and families clearly it isn't going to be an easy task for us too. Remember, an advice is like a gift. A person may receive it but it is up to them what they want to do with it. They may want to "use" it tomorrow, next week or next year. It's their choice. Your only role is to convey the message sincerely and be supportive of the person you were trying to help, especially if they are making a conscientious effort to change for the better. Put yourself in their shoes and, God willing, you'll be able to treat them with more understanding and kindness. As always, this is a reminder to myself, first and foremost. For better tips on the art of giving advice, Seekers Guidance has a great list of Q&A on giving advice and commanding the good, alhamdulillah. This is a great reminder, thank you.